The following is an illustrated proof for the Tough Sudoku of April 5, 2007. The main techniques that I used to solve this puzzle are Y Wing Styles and Coloring. By Coloring, I mean any technique that uses exactly one candidate to justify an elimination. You may wish to refer to previous blog pages to properly understand this proof. Links to these pages are found to the right, under Previous Entries. This page illustrates only the deduced elimination steps that I choose to solve the puzzle. Although many other steps are possible, they are not shown, as to show every possible step is prohibitive in both time and space! Definitions: If a term is used on this page that you do not understand, the definition is likely here! Strong and weak need not be mutually exclusive properties. Although there are many steps available at this point, such as the naked pair 12 at e46, the following sequence of steps will render most of them superfluous. These eliminations do not directly solve any cells, but they are a set up for a short sequence of steps. Since both candidates 1 & 3 are limited to the same two locations, a2,c2, in a house(s), no other candidates can exist in those two cells. I have illustrated the elimination as a short continuous nice loop forbidding chain, or Alternating Inference Chain (AIC). One could alternatively use the naked quad 5689 at abc1,c3 to make the same eliminations. Also, if one does use the naked quad, then one can also make the next eliminations at the same time. Illustrated above, the 5s in box b2 are limited to two locations, ab1. Since both of these locations exist in row 1, 5 cannot exist in row 1 outside of box b2. 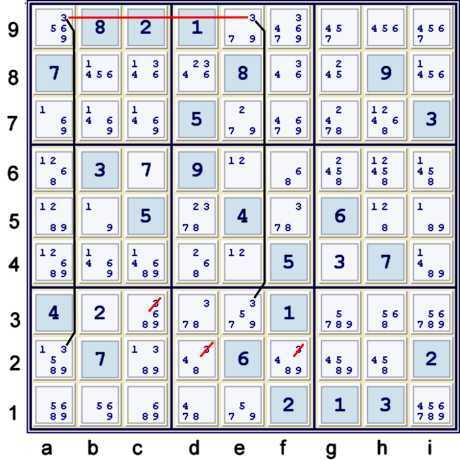 If one had used the naked quad instead of the hidden pair 13, one could have made the elimination of these two 5s at the same time, as the naked quad locks the 5s into the same cells. After eliminating the 5s from ei1, a cascade of Unique Possibilities (hidden and naked singles) occurs until 53 cells are solved. 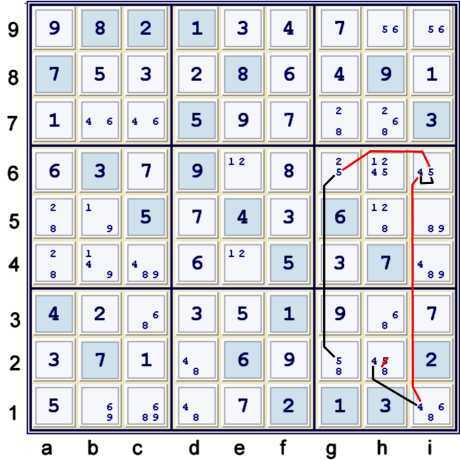 The cascade begins with e3 = 5% box & column, which then allows one to solve all the 3s on the puzzle grid. The cascade continues until one gets to the next illustration. Again, a handful of easy steps are possible below. However, either one of the next steps illustrated, or something equivalent to one of them, is all that is required to unlock the puzzle. Since the forbidding, or weak, links are universal, there is usually no need to detail them. No matter how one finds it, once 5 is forbidden from h2, the puzzle is reduced to a cascade of Unique Possibilities until all cells are solved. (UP 81). This puzzle is an excellent puzzle for study for someone who wants to tackle the tougher puzzles. It is not too difficult, but it does at least require some advanced steps. Hopefully, the illustration of the last step as either a Y Wing Style or a standard Y Wing is a sufficient demonstration of the fact that both steps are completely equivalent in complexity. The logic for each is precisely the same. Only the nature of the strong inferences is slightly different. Personally, I find the Y Wing Style using only two candidates, 4 & 5, to be slightly easier than the standard Y wing using 3 candidates. No matter which one finds easier though, it is useful to have both in one's bag of tricks. I'm still struggling but: Doesn't the locked pair 4,6 at bc7 eliminate the 6 at h7 and thus the link from h9 to h3 is strong? Maybe I have to go back to basic definitions and theorems, but if 'strong' implies 'at least' one must be true, and if, in a given container, no more than one CAN be true, does that not define the set population as 'two'? One can partition the set anyway one pleases. Thus, the number of items in the set, is not limited to two, but in fact can be any integer greater than one, including one. Although I do understand your last statement about the unitary set, I'm afraid I still lack a solid understanding and competency in the AIC process. I'll review your basic stuff and try again. Thanks for taking the time trying to educate me. noting OR is not exclusive or, but rather UNION. A -- B means ~A OR ~B. Perhaps thinking that way can help you too. Your definition A--B implies ~A or ~B helps a lot, but doesnt the weak link I tried in the following case satisfy that definition but not Dave's? I cannot follow what you have posted. Perhaps let me know the puzzle state from which the logic comes. Also, it is almost certain that some typos have occurred. Steve, I appreciate your spending all this time with me. Let me reduce this to the basic question. Is the weak link g1=8--b1=6 valid? If I have still screwed this up, don't waste your time any further and thanks again. Don't bother. I think the light has partially dawned, the answer is YES, and you have helped a lot! You were correct. My definitions of strong and weak were totally too restrictive. See my comment / question on the 1 Feb Proof if you have time.